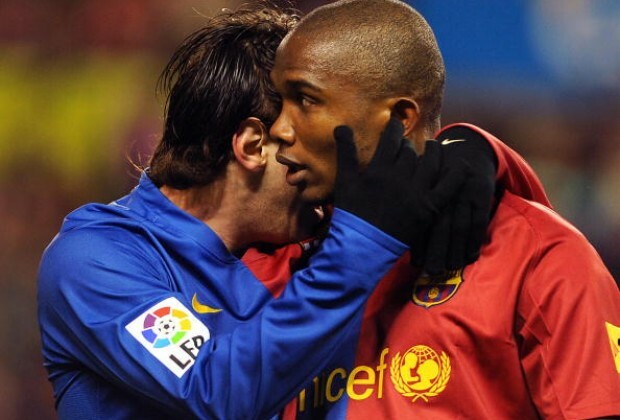 Ten years after leaving Spanish giants FC Barcelona, African legend Samuel Eto’o has once again slammed manager Pep Guardiola, while he also made a claim about superstar Lionel Messi. When Guardiola was appointed Catalan club boss in 2008, Eto’o was one of the players he felt the team could continue without, something that the Cameroonian legend still appears bitter about. The striker ended up staying at the Blaugrana for one more season, before joining Italian giants Inter Milan in a swap deal involving Zlatan Ibrahimovic in 2009. Reminiscing on his time under Guardiola, Eto’o insisted that he was the heartbeat of the team, suggesting Messi of then was not the Messi of today. "Pep had lived all his life in Barcelona but during the years I was there, he didn’t understand the squad," he told beIN Sports. "He didn’t live the life of our group. I told Guardiola,'you will apologise to me because it’s me who will make Barca win, not Messi'. "That was the situation at that time. Messi would later emerge, but you could ask Xavi, Iniesta and the others, that was my era. "It was me who made Barca win and Pep would say sorry." Eto’o scored 36 goals and created a further eight strikes in 52 matches in the 2008/09 campaign, in which they won a famous treble. Do you agree with Eto’o sentiments? Let us know in the comments section below. @MaHlophe(N.W) It baffles me too as to why people like to crucify Pep for the decisions he takes. Au contraire to Zlatan labeling him as "ball-less" I would like to think he is the most balsy coach we have ever seen, he is not the least afraid to chop characters he does not see streamlined with his vision when he joins a team. He does not fear the star players and better yet, his methods have made some players shine to their utmost best. I wouldn't be too sure that Eto'o and Yaya's issues with Pep were based on them being black, because Pep also had problems with Ibrahimovic, who's not black or African. Pep has shown that he is a shrewd coach over years, In Germany, even dominating the EPL, which proves he's a very smart coach. Even at Barca, changes or decisions he took against Deco, Ronaldinho, Yaya and others, benefited the team coz they became successful with the players he fielded. So this issue is hard to understand or make a conclusion on it, coz even Pep doesn't come out to defend himself when Yaya,Eto'o or Zlatan attacks him.